The main function of the New York State Outdoorsmen Hall of Fame to honor the sportsmen and women who have made significant contributions to conservation or preserving the heritage of outdoor sports. These people are inducted into the Outdoorsmen Hall of Fame and honored at the annual banquet. Plaques highlighting their achievements are displayed in the Outdoorsmen Hall of Fame for all to see. Men and women are carefully selected for this honor based on what they have done to preserve our outdoor heritage, enhance opportunity, or support the causes of conservation and outdoor sports. Selection for this distinguished group is not based on individual achievements, but rather what they have done for others. Currently there are over 250 men and women honored with induction. They include outdoor professionals such as DEC personnel, media professionals, such as outdoor writers, public officials, leaders of conservation organizations, and outdoorsmen and women in general. All inductees have given selflessly to improve hunting, trapping, and fishing and to preserve our environment. All have given many years of volunteer service and accomplished significant things to help others, especially future generations, enjoy the outdoors. 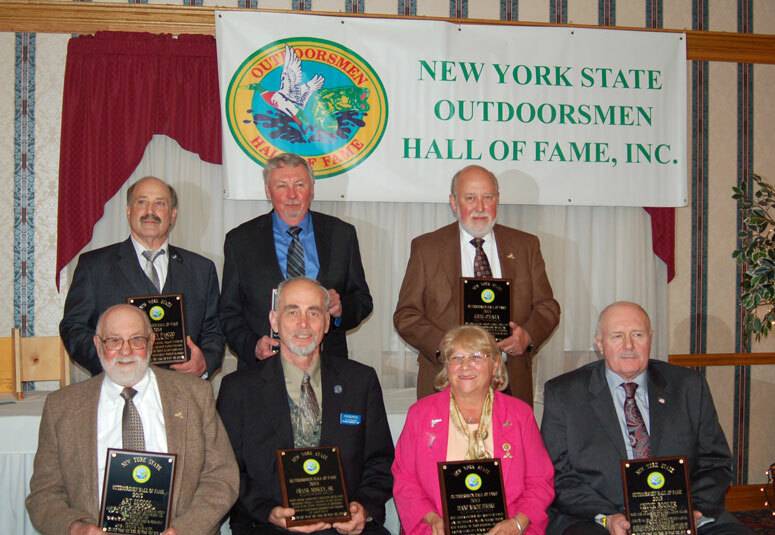 The New York State Outdoorsmen Hall of Fame recognizes these individuals from all parts of New York State and creates publicity about them through press releases to the media and various conservation organizations. By doing so, the Outdoorsmen Hall of Fame not only seeks to honor these people but to draw attention to the causes they have served and encourage others to give of themselves for projects related to the outdoors. The New York State Outdoorsmen Hall of Fame is also involved with other activities that further the enjoyment and preservation of the outdoor heritage. Members frequently present seminars, conduct clinics, or are involved in educational displays and programs. There is a special focus on youth and getting them involved. The Outdoorsmen Hall of Fame conducts youth fishing derbies, casting clinics, working with handicapped youngsters, or the youth hunts. Some members of the Outdoorsmen Hall of Fame have made major, well-publicized achievements. Others have worked anonymously helping achieve their goals slowly over many years. By recognizing them and uniting them in a common organization the Hall of Fame helps to create even more momentum for the common goals.